At ZigZag we love to introduce you to crazy, creative ideas that we know you’ll love as much as we do and it’s now time to reveal a very special collaboration we’ve been dying to unveil for weeks! She's worth a follow purely based on her *things to do around Leicester* recommendations. If ever a job suited a person as much as face painting suits Natasha, she'll be winning awards soon enough. Her passion and creativity know no bounds and her business is about to skyrocket into something amazing. We know this because ZigZag Photography are officially a part of it! We are proud to be the first professional studio in the area (as far as we know!) to offer a BUMP PAINTING EXPERIENCE in our lovely studios, featuring the amazing talents of this experience artist. Natasha believes that face and body painting should feel more like an experience, rather than a quick novelty. We all remember the summer fairs we had as kids, no child could resist the colourful animal patterns and pretty craft boxes full of potential wonder. Ahhk cool! A tiger! Spiderman?! Mum, mum pleeeeease! And she'd allow it because how often do you get to do something this quirky? Your eccentric design lasts for the rest of the afternoon and you and your family are fresh out of energy from the wonderful summer's day activities. Face paint comes off at bath time, or for some unfortunate souls, tea time. And that's it! All over. But, what if this amount of creativity could be transferred? Not just to faces, but to the arm, and to the body! This is how Natasha got the name Hi5! For obvious reasons, she needed to give the kids the highest of fives. For the two years that Hi5Faces has been active, Natasha has worked with many other professional face painters and companies like Curve Leicester,Toyota Derby and SamiTipi <--- this sounds amazing! A tipi party?!?! YEAH! So as well as kids' birthday parties and zoos, Natasha is a solid community driven gal, she has made wonderful connections everywhere at events and top notch locations showcasing her amazing artistic talents. 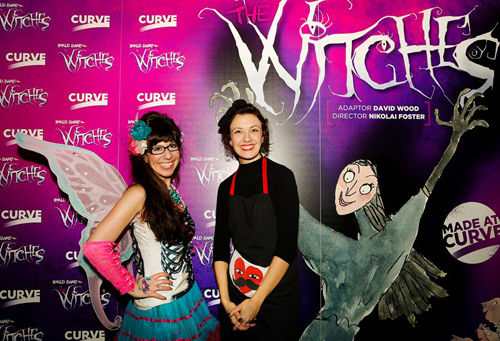 Below, Natasha says, "This was at the Curve Leicester during the press launch of The Witches. It was a huge deal so they put on free face painting for the patrons! I created some special designs based on the costumes featured for the production!" Natasha worked with Livi Lollipop at this event, another amazing face painter/body art specialist within Leicester. "We painted before the play started and then again during the interval. I was at the Curve again for the LCFC parade in May. We had HUNDREDS of kids even before the bus drove past - it was mental! Hi5 Faces and Livi Lollipop ended up on TV!" Some images below belong to Livi Lollipop and her website is found here. What is the Hi5Faces x ZigZag Photography BUMP PAINTING EXPERIENCE? Your bump gives you an excellent artistic licence to photograph every stage of your little one growing, but what if you had the chance to do something totally different? Pregnancy goes by in the blink of an eye, but Natasha's bump painting experiences will be with you forever. Natasha says "Bump painting is almost like a pampering experience for the mum - it's a chance to do something creative either by yourself or with loved ones. Simply sit and and enjoy someone else making a fuss of your beautiful bump! Each design is created in full collaboration with the mum-to-be and can range from ideas unique to the family or adapted from inspiration elsewhere." Natasha works with local suppliers and businesses to provide a variety of marvellous extras, such as professional photographers.... Like us! To capture the amazing results, or beauty treatments to make it all super special. This is 100% safe and 200% fun, Natasha's main priority is mum and baby's safety and comfort, Hi5Faces uses top quality and professional paints which are dermatologically tested and meet all EU safety requirements. Natasha's also covered by Public Liability Insurance for your peace of mind. Bump painting is fun, an opportunity to create unique photos of you at a precious stage of your baby's development, and a way to get CREATIVE as mums can design their own art! Designs can also incorporate other members of the family so it can become a great FAMILY PHOTO OPPORTUNITY! Or how about a baby shower where all of your closest friends can take part in one big cool design? The length of time pregnancy art takes depends entirely on the complexity of the design, but allow at least ONE HOUR - some can take up to TWO OR THREE but this is decided at the point of choosing your design. You are free to move around and rest at any point during your session. People will ask what's the point? We say why not! This is a wonderful experience for any mum-to-be who's after something a little out of the box. How much is the bump painting experience? Call either our ZigZag studio on 0116 270 0995 or email studio@zigzagphotography.co.uk for any queries and questions, or call Natasha on 07966 490099 or email her at hi5faces@gmail.com. If you're happy to make an appointment, call ZigZag Photography and we will book a date that's best for you. Your details will be passed on to Natasha at Hi5 Faces (and no one else), where she can discuss ideas/props/story you'd like to tell with your bump. Payment of £25 non refundable deposit is taken over the phone when booking in with ZigZag; this secures your date and time with ZigZag and Hi5 Faces. Final payment of £30 is taken on the day you come in for your bump painting experience. ZigZag Photography and Hi5 Faces are proud to be working with each other, we hope to help create beautiful memories for yourself and your family as well as make this a really enjoyable experience! Check out Natasha's growing 5* reviews! Proof you're in good hands. Still struggling to imagine it? Check out this video of our most recent bump paints! An extra special mega thank you to Megan and Katie, our awesome bump models for this video and Hi5Faces newest images! We really could not have accomplished this without you ladies and we both thank you for your patience and courage for everything!